The chandelier is so beautiful!!! You did such a good job it just unbelievable. It is just stunning!!! Kay doesn't have it hung yet. She is waiting for the electrician. It's big!! The shells on it are just amazing and so beautiful. Love the little aqua ones.It's more beautiful than I even imagined . Everyone that sees it can't believe you really did make that!!! Love you talking about it on YouTube!!! The room is just going to be absolutely beautiful!!! She will have to send you a picture when she gets it all done. Can't thank you enough!! Just wanted to let you know that the electricians came yesterday to hang the chandelier at Kays. It is so gorgeous and flat out just amazing hanging!!! I love how I look at it and find something knew and unbelievable every time I see it. You really did a beautiful job!!! I know you are so proud of it!!! Kay just can't stop looking at it. 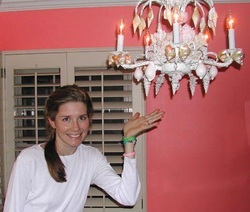 It is the prettiest chandelier in her house, and she really has others that are real pretty too!!! Just another thank you!!! Hope you and your family have a very Happy Thanksgiving!! 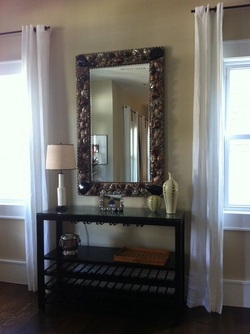 Beth Crisler - "Been saving for 2 years for a Heather mirror! Almost there. It's the only thing on my wish list. (Other than a trip to Switzerland, Canada, somewhere in the Carribean and back to Europe..one day.) Cannot wait to have such a beautiful thing centrally located in my house and know my sweet friend from all these years made it. This is SO Heather!" Debi Schubring Rigg - "I love your designs!! Always think of you when I see anything with shells on it! My cousin makes picture frames with shells and broken vintage jewelry...sells them at an art studio in California. If I ever move back to FL I hope to afford one of your chandeliers! They're amazing! xoxo"
"It's finally hanging! Thanks again Heather for creating such a special piece for my husband! 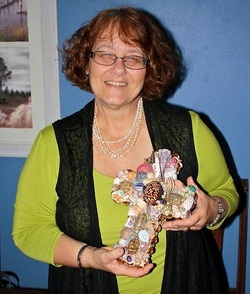 "Beautiful shell cross made by artist Heather Young Kendall. Given to me by Cris on this Mother's Day. Heather is such is a wonderful artist."